Nearest tubes: Covent Garden, Holborn, Leicester Square Free admission (a collection will be taken). 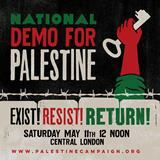 30 March, National Day of Action for Palestine. Exist, Resist, Return. Full list of events across the UK here! No new Nakba! - End the Siege! - Defend the Right of Return! Thanks to the hundreds that joined today's action outside the Bank of England including Tariq Ali, Kate Hudson, Ken Livingstone, Venezuelans, anti-war and Latin American community groups to say No war on Venezuela - No Blood for oil! Lindsey German (Stop the War Coalition) & more TBA! Opponents of Donald Trump’s war drive against Venezuela held a picket Thursday demanding that the Bank of England gives Venezuela back its gold.